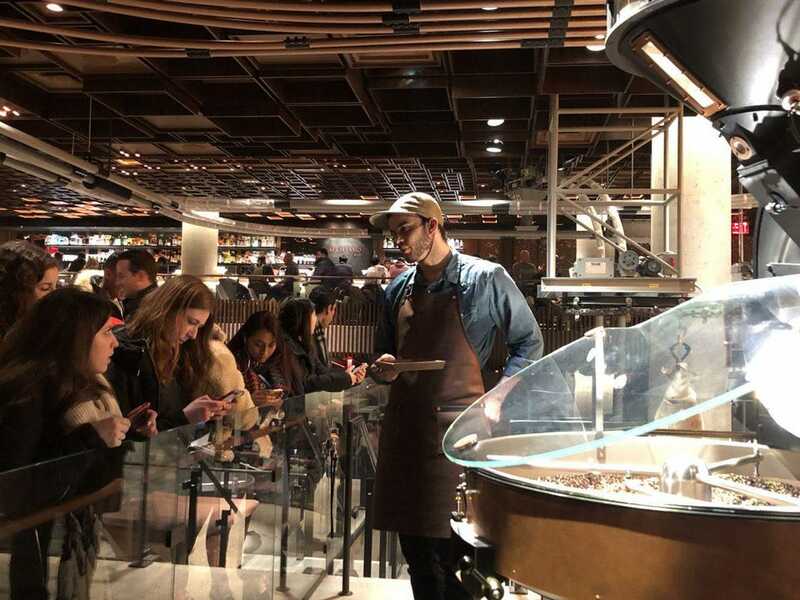 On a recent Sunday evening at Starbucks’ new Reserve Roastery in New York’s swanky Meatpacking District, throngs of customers packed the 23,000-square-foot three-story emporium, where specialty coffee, pizza and pastries to be served in-house had all been roasted or baked on site and a cocktail bar on the top floor served coffee-infused alcohol. 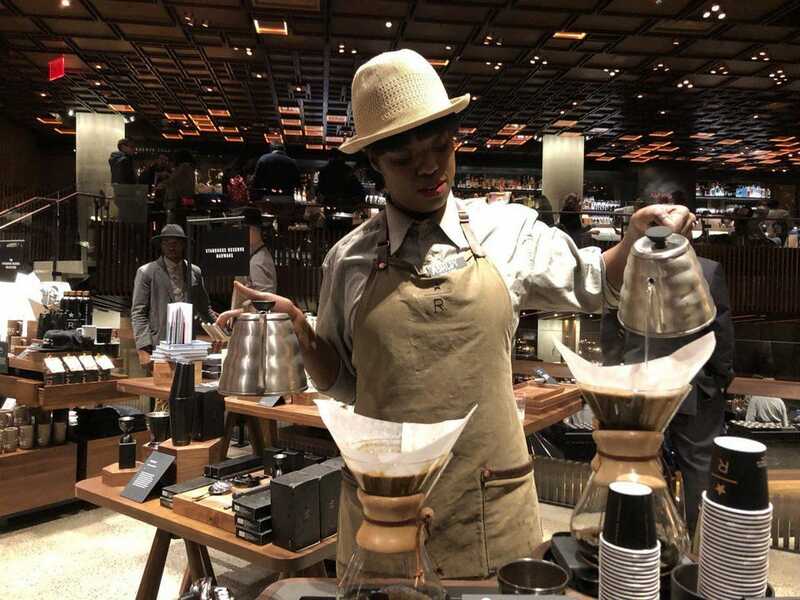 At the center of the store, a barista in the location’s signature newsboy-style gray shirt and khaki pants served up special-batch Costa Rica coffee samples after a siphon coffee demo and talked about how she, a six-year Starbucks employee, had applied to work at the location and gone through a three-month training on coffee before the store opened. Meanwhile, as a customer self-described as a coffee connoisseur sampled the siphon brew, he expressed satisfaction with how it had delivered on its artisanal promise. As Starbucks is faced with more competition than ever, from McDonald’s McCafe on the low end to Blue Bottle Coffee on the upscale end, the new Reserve Roastery in New York is one way the Seattle-based coffeehouse giant is looking to keep its coffee cachet and keep its customers frequenting its nearly 30,000 regular locations globally. That’s not to mention that in China, its fastest-growing market and second-largest after the U.S., the company is contending with what president and CEO Kevin Johnson described as “highly promotional and disruptive” competition. As part of its plan to stay at the top, Starbucks is working with Uber Eats to deliver coffee to cities including Miami and San Francisco, with a goal of delivering from nearly a quarter of its more than 8,000 U.S. company-operated locations by the spring. In China, Starbucks has worked with Alibaba to deliver from more than 2,000 stores, a number that it said will continue to grow. As part of the industrywide push to use tech and other tools to free employees from tasks so they can spend more time with customers, Starbucks said it has moved some cleaning tasks to after hours and is automating product planning and replenishment to reduce clutter. The company is also working with Microsoft to cloud-connect its coffee and other machines to track demand and beverage consistency. Not surprisingly, Starbucks is on board the data science bandwagon and is studying consumer preferences to better personalize and introduce offerings. For instance, it said it unveiled a limited-edition red cup promotion during the holidays in response to popular demand. It’s also expanding its draft Nitro cold brew to all of its U.S. company-owned locations by the end of fiscal 2019, from about 40% currently. These and other efforts have paid off. The company’s shares rose 4% on Friday to a near-record high after it reported better-than-expected fiscal first-quarter profit and sales late Thursday and said the number of its U.S. Starbucks Rewards active customers jumped 14%, to 16.3 million, in the quarter that ended Dec. 30. Global comparable store sales increased 4%, led by a 3% increase in average transaction amount. Same-store sales rose 4% in the U.S. and 1% in China even though transactions, an indicator of traffic, declined 2% there. Starbucks’ growing crop of competition also looks to have a ways to go to catch up, at least when it comes to market share. The company’s U.S. share in the specialty coffeehouse market jumped to 66.7% in 2017, from 58.8% in 2012, according to Euromonitor. The No. 2 in the U.S. space, Caribou Coffee, saw its share dip to 1.5%, from 1.6%, during the same time. Globally, Starbucks’ share in the space rose to 46.1%, from 39.4%, over that time while No. 2 McDonald’s McCafe’s share stood flat at 3.1%, Euromonitor data shows. Last year, Starbucks licensed its global packaged coffee business to rival Nestle to distribute its coffee to supermarkets and restaurants worldwide. The company said late Thursday that Starbucks coffee will be rolled out on Nestle’s Nespresso and Dolce Gusto machine platforms beginning this spring. Even as rivals nip at its heels, with global middle-class consumers increasingly on a coffee kick, it looks like Starbucks will have the wind at its back.